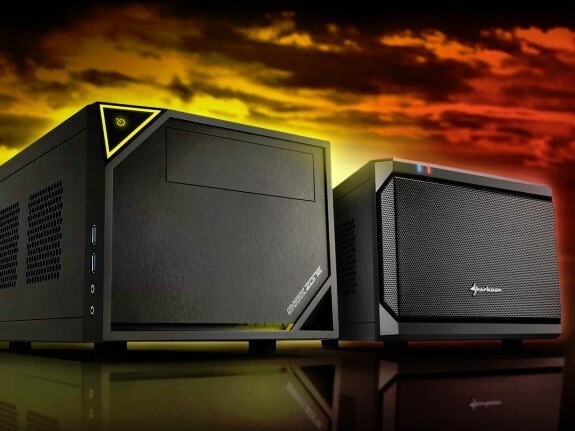 Sharkoon announces the Zone C10 and QB One, two new Mini-ITX cases with a MSRP of just 39.99EUR. The trendy SHARK ZONE C10 Mini-ITX PC Case is aimed at gamers and offers maximum flexibility within the smallest of space. With its compact dimensions of only 37.0 x 22.5 x 18.0 centimeters (L x W x H), it is ideal for mobile and space-saving use at your next LAN party. The case can be used not only horizontally, but vertically as well. Inside the case dual-slot graphics cards with a maximum length of up to 31.5 cm can be installed, and is available with a 5.25" drive bay for an optical drive and installation options for a 3.5" hard drive or a 2.5" HDD/SDD. Without the 5.25" drive bay, up to two 3.5" hard drives or two 2.5" HDD/SSDs can be installed. An additional 2.5" HDD/SDD can be mounted on the rear panel, instead of an 80 mm fan. CPU coolers with a maximum height of up to 15 cm can be used. The case has a convenient installation opening to easily mount fans. A quiet 120 mm fan is pre-installed at the top and, if needed, an additional 120 mm fan can also be mounted. If no optical drive is installed, the top also has room for a 240 mm radiator. All side panels are equipped with dust filters and offer ventilation openings. An 80 mm fan can be installed to the rear panel. The front features two USB 3.0 and Audio ports. Practical thumbscrews simplify the opening as well as closing of the case. The SHARK ZONE C10 is compatible with SFX and non-modular ATX power supplies. The elegant QB ONE Mini-ITX PC Case offers more than enough space for all the necessary components thanks to its carefully planned layout. Its dimensions are a compact 36.8 x 22.5 x 18.0 centimeters (L x W x H). The elegant design is recommended for use in the living room as, for example, a powerful gaming PC with use in a vertical or horizontal position. All side panels offer generous ventilation openings with dust filters and thumbscrews. An optional 80 mm fan can be mounted to the rear panel. A 120 mm fan is pre-installed at the top and, if needed, an additional 120 mm fan can also be mounted. If no drive is installed, the top also has room for a 240 mm radiator. In the front, two USB 3.0, two USB 2.0 and two Audio ports are provided. Installation of a dual-slot graphics card, up to two 3.5" hard drives or two 2.5" HDD/SSDs as well as a 2.5" HDD/SSD instead of an 80 mm fan is possible in the rear panel. CPU coolers with a maximum height of up to 15 cm can also be mounted. The QB ONE Mini-ITX PC Case is also compatible with SFX and non-modular ATX power supplies. End customers will find the Sharkoon SHARK ZONE C10 available for the suggested retail price of 39.99 euros from authorized retailers. The Sharkoon QB ONE Mini-ITX PC Case is also available for the suggested retail price of 39.99 euros.